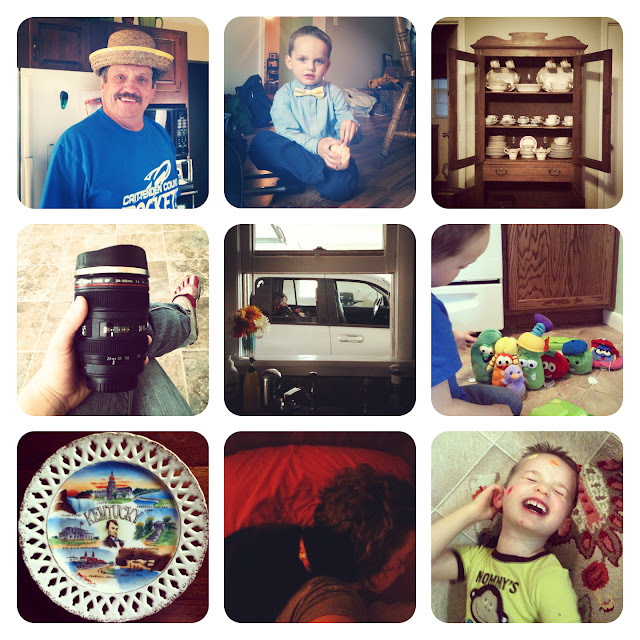 Inspired by a new (to me) blogger that I've started following, Meg Duerksen, I'm going to try to do a regular InstaFriday post, where I share some of my favorite pictures from Instagram from the week. It seems like an easy step back into regular blogging, right? She links her posts up to another blogger who I need to start following, Jeannette at Life Rearranged, and I think I'll give that a try. Anyway, so here are some Instagrams from this week! 3. My antique china cabinet that my mom and cousin refinished with my antique china that my Irene gave me a long time ago. It now finally has a home in my home instead of my mom and dad's home. 4. The new travel mug my mom gave me. I love it. 5. Our kitchen window looks into our attached garage, and I love being able to leave Jude in the car and open the windows when he falls asleep in the car! 6. Jude got some new (to him) VeggieTales friends this week. 7. The vintage Kentucky plate I found for Jude's Kentucky-themed bedroom. 8. Our black cat, Dinah, being weird and rubbing her face in my hair. 9. Having fun with my boy and some yard sale stickers! so, what appears as a camera lens is a travel mug? neat gift! nice shots of your life...you are blessed! good to have you posting.